The London Foodie: Hestan’s NanoBond™ Technology – The Crème de la Crème in Cookware or Just Another Marketing Ploy? Hestan’s NanoBond™ Technology – The Crème de la Crème in Cookware or Just Another Marketing Ploy? For the Shokunin in Japan, craftsmen who specialize to an extraordinary degree to be masters of their profession, the search for excellence and even for perfection is a never-ending journey. 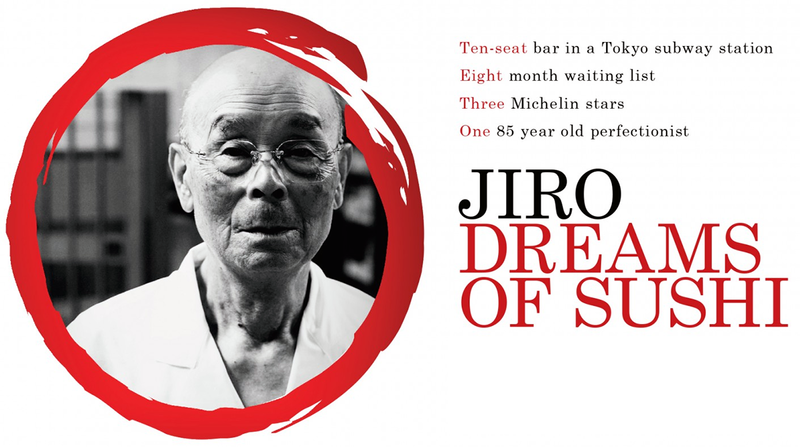 Ninety-one year old Jiro Ono is Japan’s highest expression of Shokunin; he has worked tirelessly from the age of 7 to become the greatest sushi craftsman alive today. Ono is still to be found at his sushi counter at Ginza station, serving up perfect morsels of vinegared rice, yet his drive for perfection is far from finished. Reading about Hestan’s founder Stanley K Cheng in Napa Valley USA, I found a lot of resonance with the work of Jiro Ono and hundreds of other Shokunin I have encountered in Japan and across the world. Cheng’s lifelong quest has been to innovate and excel in the cookware industry. Since the 1970s, he has been at the cutting edge of his field, including the introduction of non-stick surfaces to hard anodized aluminium, the breakthrough which led to non-stick cookware. Today, his company (Hestan and Meyer Corporation) is the largest cookware distributor in the USA and the second largest in the world. 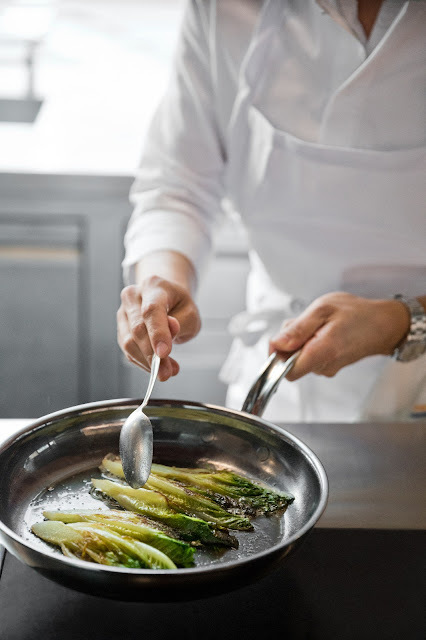 Cheng has created a culture of excellence around the Hestan name that goes far beyond its cookware. There is the Hestan Vineyards in Napa Valley, as well as Hestan Commercial and Hestan Outdoor cooking appliances. Hestan Commercial reinvented the restaurant kitchen with a lineup of well-designed commercial cooking equipment, one of their most notable advocates is Head Chef and Shokunin Thomas Keller of the 3 Michelin-starred restaurant The French Laundry. Most intriguing for me though is the Hestan Barn, a culinary “think tank” and laboratory that brings together a team of outstanding chefs, engineers, designers and winemakers to revolutionise cookware and think of different ways to cook. It was here in the Hestan Barn that the USA team trained for the most prestigious international cookery competition, the Bocuse d’Or, winning the gold medal in 2017. It was also here at The Barn that Stanley Cheng and his team developed a new cookware range with Hestan’s NanoBond™ technology. With 14 global patents, NanoBond technology uses a triple-bonded construction: thousands of titanium-based nano layers bonded directly to stainless steel, itself wrapped around a central core of pure aluminium. The resulting super-dense cooking surface is said to be stain and scratch-resistant, and the titanium coating to last a lifetime. It does not use any chemicals or coatings that might wear off over time like what happens with standard non-stick pans. 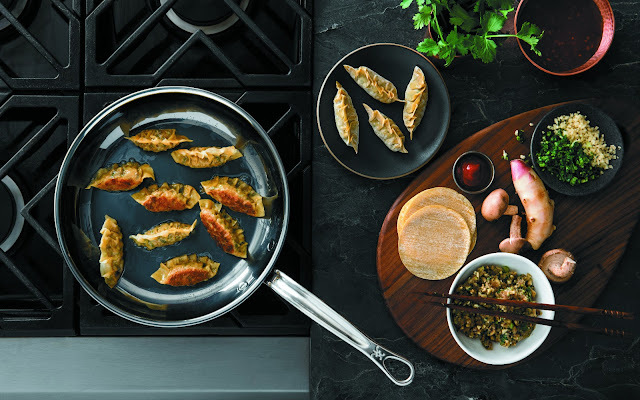 Pans with NanoBond™ technology are also said to have 35% better heat conductivity and to be 400% (four times) harder than stainless steel pans. They certainly have a gorgeous design, with elegant ergonomic handles and flush rivets. 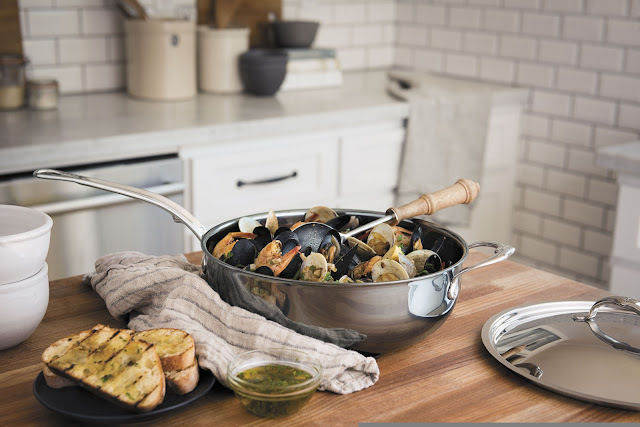 - have five times the lifespan of a normal stainless steel or aluminium-clad cookware. Launched in the USA in January 2017, the NanoBond™ range is sold exclusively there by Sonoma-Williams, and in the UK, you will only find it at Harrods, where it was launched in September 2017. The pans feel really sturdy and solid, substantial without being too heavy. On closer inspection, the design is beautiful with a pewter-grey tinge to the surface. The surfaces are silky smooth, and even the rivets binding the handles to the pan are recessed to avoid food getting stuck and making them very easy to clean. The handles are ergonomically designed from case stainless steel, being wide and flat to enable a good grip without risking them over-turning. The Hestan logo is beautiful, written in full at the base of the handle, and with an embossed H at the tip. Frying pans and saucepans have an oval slot in case you want to suspend them from a hook, or alternatively they stack efficiently. During my time at Le Cordon Bleu, I got to use and was impressed by top quality cookware from the American firm All Clad, and by de Buyer from France. Top professional kitchens around the world will be familiar with these, as they have been considered to be the best of their type and to deliver consistent cooking results. Hestan's is, however, aiming to raise the bar by introducing its NanoBond™ technology to their pots and pans. Today at my supper club events and cookery classes, my Hestan pans get heavy use and are bashed around a lot. Even though I do not have Le Cordon Bleu’s budget, I have always looked out for cookware that is well made, and of as good quality as I can afford. Beautiful as new after 5 months use! The Hestan pans I have used over the last five months still look nearly as perfect as they did when I first came out of their boxes. Though they have not been scratched or dented, I noted some colour tarnish at the bottom of the pans. From my years of cooking experience, I know that fried food does not stick if the pan has either a non-stick coating or if it has been proofed with a built up layer of oil and salt over time. Although not completely non-stick, I found that Hestan’s 28 cm frying pan’s surface was indeed ‘stick resistant’, and this did not wear off over time, as non-stick coatings do sooner or later in my experience. Though there were some desirable signs of food caramelization visible on the surface of the pan, food did not stick. There was rapid heat conduction on either my Aga hot plate or a conventional gas flame, and even fried eggs cooked uniformly and came away smoothly from the pan. But for me, the major advantage of the Hestan pans was the evenness of heat distribution and the rapid conductivity of heat. Don’t you hate it when you are cooking something and parts get burned while other areas are still not cooked? This was definitely not the case with Hestan’s 36cm wok – with no limit to high heat and improved conductivity compared with other standard pans, Hestan’s wok quickly achieved searingly high heat, just ideal for imparting that desirable ‘wok-breath’ (a wonderful charred flavour) into my stir-fried food. Hestan’s range of pans are all metal, with no plastic, rubber or other materials, making them ideal for use in the oven as well as on stove. In many professional kitchens, steaks and other meats are usually caramelized in the pan over a high flame (pan-fried), and then finished in the oven to complete their cooking under an even heat. 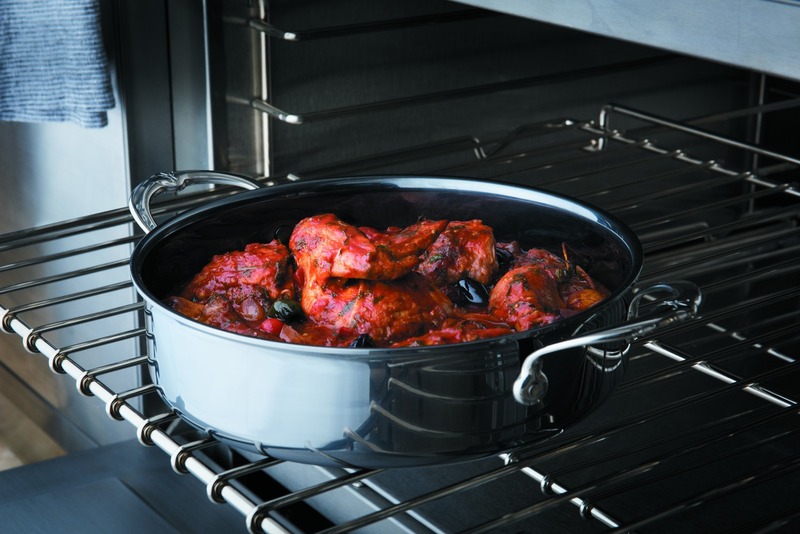 Hestan’s range are well designed for this purpose, while looking great on the table too. 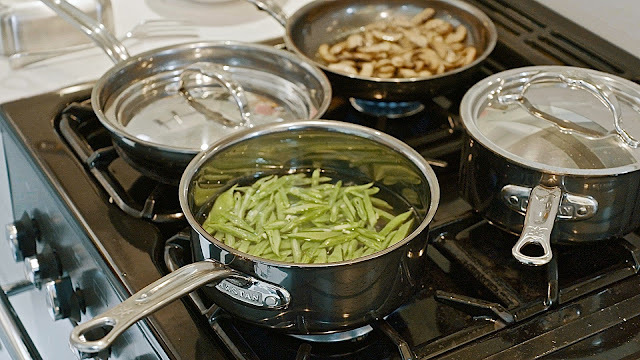 Over the five months I have used Hestan’s pots and pans at home and at my supper club events, I have been reassured that the company’s claims really do stack up. With great heat conductivity and evenness, the pans are also durable and will probably last many years. They are sturdy, well-designed and gorgeous too. A decent, well-designed pan can make or break your meal. Choosing the correct vessel (for both its quality and size) to cook a dish is an important decision that will help you make the most of your cooking. With busy working lives and less time now spent in the kitchen, pans like Hestan’s will make this time count giving you consistently good cooking results. Hestan pans are not cheap, but good quality equipment never is. If you want the best pans you can afford in your home and business that will last a lifetime and take up that up that precious kitchen cabinet space, consider buying Hestan’s. You do not need to be a Shokunin or 3-star Michelin chef to cook a great meal at home. But in your pursuit for kitchen excellence, Hestan is here to help along the way. To discover more about Hestan and their range of cookware, visit their website here - https://hestan.uk.com/. To purchase Hestan cookware, visit the Harrods store or website here - https://www.harrods.com/en-gb/designers/hestan. 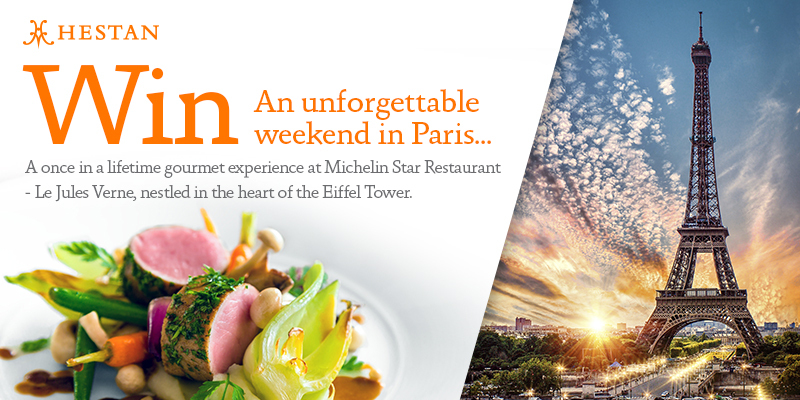 To celebrate the launch of the luxury cookware brand in the UK, Hestan is running a competition for a chance to win a gastronomic weekend in Paris! The prize includes flights for two from any UK airport, a 2-night stay at the prestigious hotel in the centre of Paris, La Maison Champs Élysées and a gourmet culinary experience at Le Jules Verne, Michelin star restaurant owned by the most renowned chef of his generation, Alain Ducasse. This review feature was commissioned and sponsored by Hestan. The London Foodie maintains full editorial control over all content published on this site as always. Do you know aba store in Brazil selling Hestan NanoBond?